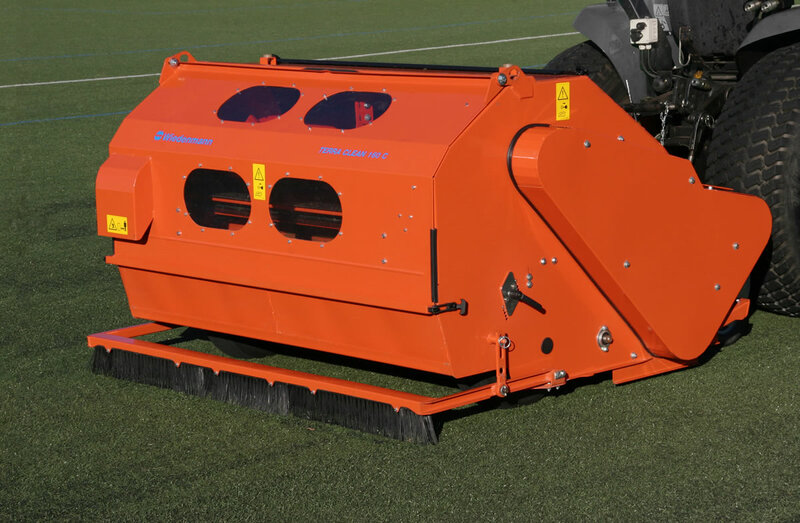 For intensive cleaning and dust separation of infilled artificial turf surfaces. Some synthetic surfaces need to meet rigorous performance standards meted out by the likes of FIFA, World Rugby or the FIH. Increasingly as synthetic surfaces become more elite keeping them properly cleaned and maintained is very important. The Terra Clean 160 is a sweeper collector aimed at this high performance sector as it too, offers world first technology and stands apart in the artificial maintenance market. It can operate in damp and dewy conditions yet still leave a thoroughly cleaned and groomed surface. Uniquely it combines both a dust cyclone extraction system with a sieved separation system to filter and remove miniscule deposits. Its exceptional cleaning capability means it rids a pitch of much of its powdered rubber crumb, an exceptional process which prevents the playing surface being sealed and compacted by these fine dust particles. This twin operating system means it has huge eco credentials and excellent results. The Terra Clean 160 uses the cyclone filter system to draw and remove dust. Environmentally this technology hugely benefits both the operator and the facility as fine particles of dirt are removed safely and quickly. Optional equipment: Lighting kit, coarse spring tine set. If you are interested in our TERRA CLEAN 160 / 160 C use the quick enquiry form below.